Since October 19, 2007 we have been an officially sanctioned chapter within the Parrotheads in Paradise (PHiP). 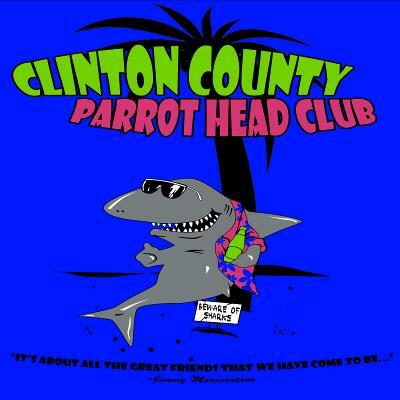 The Clinton County Parrothead Club (Landsharks) is a non-profit organization whose purpose is to help charitable organizations, assist in community outreach programs and to provide for its members a means of social interaction and meeting people interested in Jimmy Buffett’s music & tropical spirit. If you are interested in becoming a member of the Clinton County Parrot Head Club, memberships are $25 for a single membership or $40 for a couple. In the period 2002 - 2017, Parrot Head Clubs collectively raised for and/or donated to charitable organizations millions of dollars. Additionally, chapters worldwide donated approximately 5 million volunteer man hours!! man-hours to philanthropic activities !! Here's your opportunity to be a part of something special & to give something back to the community, to the environment and to your fellow man. Come join the "ParrotHead Nation" and help us "Party For A Purpose!" What Is A Parrothead ? To answer your question…We are people who enjoy the Jimmy Buffett lifestyle and believe in his idealism of "doing something nice for the planet. " We are a group of people who not only like to party, but enjoy getting involved in a variety of community and environmental services. Our motto is "Party for a Purpose". We hold events and volunteer time for different causes. COMMUNITY LINK –As an innovator in the human service industry since 1972, Community Link provides a variety of services to over 500 children and adults with developmental disabilities. CLINTON COUNTY RELIEF FUND— The Clinton County Relief Fund was started in September 2001 in the aftermath of the 9/11 tragedy and was set up to provide relief for a local tragedy such as fire, weather, etc. The Relief Fund also provides for families of fallen emergency volunteers. Since its inception in October 2007, Clinton County Parrothead Club has grown to 100+ members and has already become a part of Adopt-A-Highway (New Hwy 50 between Breese & Beckemeyer) and has had a fundraiser to buy books for area grade schools. We not only strive to help the environment & community but we also like to get out of Dodge every now and then. Parrotheads like to head to the beach or a concert whenever they can. We like to take excursions that range from a bus trip to the Loading Dock in Grafton to hanging out on Duval Street in Key West. REQUEST SPRING PHLING TICKETS HERE!